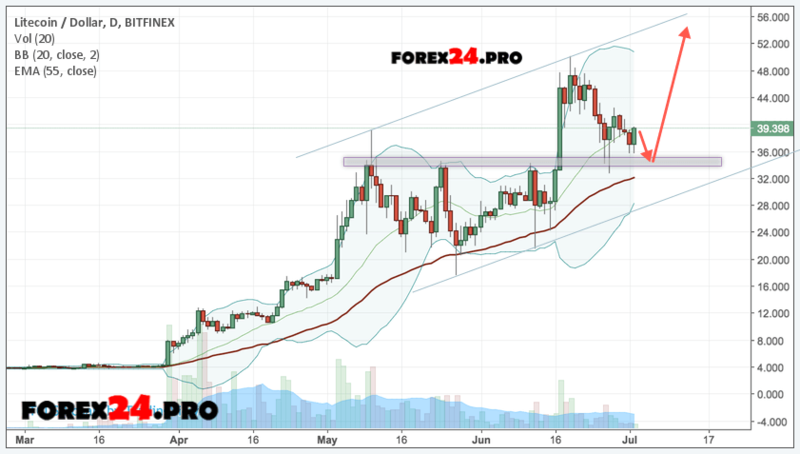 LITECOIN LTC/USD completed the trading month near the level of 37. Quotes of the currency are traded above the moving average with a period of 55, which indicates the existence of a bullish trend for LITECOIN. This is expected to test the support level near area 35, where again we should expect an attempt to continue growth and further development of the bullish trend for LITECOIN cryptocurrency with the target of growth near level 55. The conservative area for LITECOIN buying is located near the lower boundary of the Bollinger Bands indicator strip at level 30. Canceling option of continuing the fall of the LTC/USD cryptocurrency will be a breakdown of the moving average region with level 55, as well as the lower boundary of the Bollinger Bands indicator bars and the closing of LITECOIN quotes below area 23, which indicates a change in the trend in favor of the bearish on LTC/USD. In the event of a breakdown of the upper boundary of the Bollinger Bands indicator bars and the closing of quotations above 50, it is expected to accelerate the growth of the cryptocurrency. thanks your chart and prediction&analysis is good, please keep up with what you doing . is Cont.Trade at level /48/50 will cont,to move the minor Correction it’s over for Litecoin time to move on up”with Charlie lee is Focus on Litecoin alot of potential showing capacity China ”big time Development qualities abilities lead to futures to anyone in the world.global payment .LITECOIN’ will Explore .never sell your LITECOIN .it going to be right behind ETHERUM soon!!! !